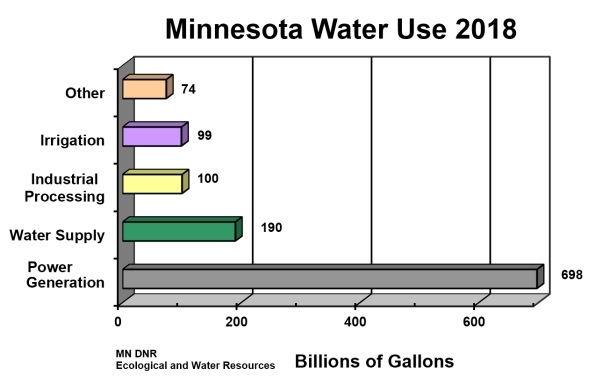 Minnesota water use data were gathered from permit holders who report the volume of water used each year. Power Generation - Water used for cooling at electrical power generating plants. This is historically the category with the largest water use volume and relies almost entirely on surface water sources. Power Generation use is primarily non-consumptive, in that most of the water withdrawn is returned to its original source. Water Supply - Water distributed by community suppliers for domestic, commercial, industrial, and public users. The category relies on both surface and groundwater sources. Industrial Processing - Water used in mining activities, paper mill operations, food processing. Three-fourths or more of withdrawals are from surface water sources. Irrigation - Water withdrawn from both surface water and groundwater sources for agricultural crop and non-crop uses. All irrigation is considered consumptive. Other - Water withdrawn for activities including air conditioning, construction dewatering, water level maintenance, and pollution confinement. Consumptive use is defined as water withdrawn that is not directly returned to its original source. Under this definition, all groundwater withdrawals are consumptive unless the water is returned to the aquifer from which it was obtained. Surface water withdrawals are considered consumptive if the water is not directly returned to the source so that it is available for immediate further use. 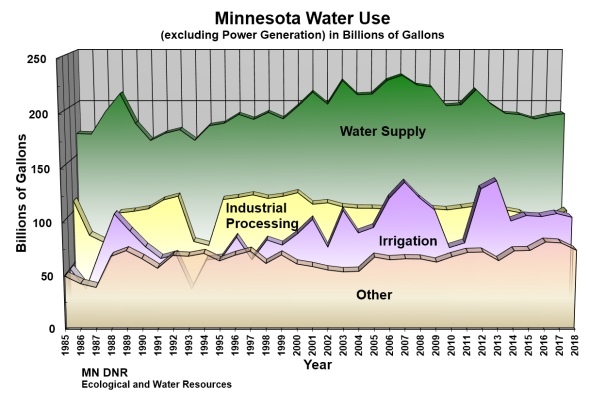 In accordance with the Great Lakes Compact, for that part of Minnesota that is within the Great Lakes Basin, the definition of consumptive use also "means that portion of the water withdrawn or withheld from the basin that is lost or otherwise not returned to the basin due to evaporation, incorporation into products, or other processes." The permit index report has detailed information on water use permits from the MPARS database. Updated September 5, 2018. The ESRI Layer Package format file contains point locations of historic and current permits with attribute data for use type, resources used and reported pumping data for 1988 - 2017.